VIRGINIA KEY, Florida -- Predation is one of the most fundamental and fascinating interactions in nature, and sharks are some of the fiercest predators on Earth. However, their hunting pattern is difficult to study because it is rarely observed in the wild. As a result, shark predatory behavior has remained much of a mystery. Now, researchers from the United States and Canada are using geographic profiling -- a criminal investigation tool used to track a connected series of crimes and locate where serial criminals live -- to examine the hunting patterns of white sharks in South Africa. Using this tool, scientists looked at the predatory interactions between white sharks and Cape fur seals at Seal Island in False Bay, South Africa. They found that sharks possess a well-defined anchor point or search base for hunting, but not where the chances of prey interception were greatest. Instead the attacks seemed to take place at strategic locations that could offer a balance of prey detection, capture rates, and inter-shark competition. "The study expands our knowledge of how large predators hunt and offers a new scientific reference for studying other predator-prey systems," explained Neil Hammerschlag, Ph.D. candidate at the University of Miami's Rosenstiel School of Marine and Atmospheric Science and co-principal investigator of the study. "Sharks are apex predators, so studies of shark hunting behavior are important for understanding their ecology and role in structuring marine communities," said Hammerschlag. "Our need for more knowledge of these fascinating animals has become critical because of recent drastic declines in their populations globally." In an awesome display of power and acrobatic prowess, white sharks attack prey with a sudden vertical rush that propels them out of the water. "They hunt solitary juvenile Cape fur seals when light levels are low, stalking them from near the ocean floor to remain undetected, before launching a vertical attack," Hammerschlag said. "This strategy maximizes a shark's chances of catching a seal unaware thus initiating a fatal first strike. 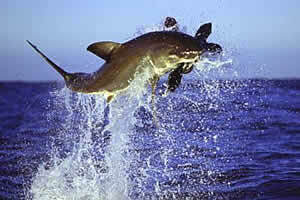 Stealth and ambush are key elements in the white shark's predatory strategy." Hammerschlag and his collaborators from the University of British Columbia and Texas State University collected data on 340 natural predatory attacks by sharks on seals in False Bay. They were able to observe natural predation by great white sharks because attacks occur at the water's surface where they can be seen from a distance. The researchers found that spatial patterns of shark predation at this site were nonrandom and that smaller sharks had more dispersed prey search patterns and lower kill success rates than larger sharks. This could mean that white sharks refine their search patterns with experience, and learn to concentrate hunting efforts in locations with the highest probability of successful prey capture. It might also suggest that larger sharks competitively exclude smaller sharks from the prime hunting areas. The findings will be published in an upcoming issue of the Journal of Zoology and is now available as an advance online publication of the journal.The study uses geographic profiling for the first time in the marine environment. The technology was originally developed by study co-author Dr. Kim Rossmo of Texas State University to determine the most probable area for a criminal offender's residence or anchor point, and has been used in a number of high-profile police investigations internationally. i hate sharks why did you put it on any way?